These Boiler Bed Materials are poured at the bottom of theBoiler as a Heat Resistance Materials. It lies between the Boiler's air box andthe burning materials. By heating these materials, the bed materials areconducting the temperature and maintain it for a long time. Hence, aprogressing rest is availed. 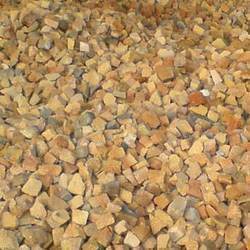 Our boiler bed material that is widely used in boilers thatwork on husk, coal and pet coke. Availablein various specifications, these materials are widely demanded by our clients.Bed Material, manufactured by our company are fabricated from top quality rawmaterial and processed through most advanced processing techniques. We Manufacture I.S.-6Quality Refractory Boiler Bed Materials with Following Specifications. We Manufacture I.S.-8Quality Refractory Boiler Bed Materials with Following Specifications.